September has very much been a month of two halves. During the first half, I spent most of the time sorting out the last of my uni stuff and spending as much time with friends and family as possible. What’s made me happy this month? Hilarious, and also incredibly rude. I can tell you from experience that it’s not a game to play with family members (unless you want your mother to suggest your special talent is ‘foreskin’) but with friends? Grab a few drinks and get stuck in. In the middle of September we had our annual get-together at my friend Julian’s farm, and ended up playing giant Snakes and Ladders, Cluedo (I won! ), Trivial Pursuit, and a card game which I can’t remember the name of, but which involves a doctor, a detective, and the mafia. It was a lovely way to end the summer break before everyone continues with university and job hunting. My brother and I both headed to university this month (me for my third and final year, him for his first), so my parents decided to treat us to a meal at The Hop and Huffkin, a restaurant in Sandwich. It’s a little more pricey than my usual haunts but damn, the food is delicious. We shared the chorizo, spinach and cheddar scotch eggs to start and they were amazing — crispy on the outside and melt-in-the-mouth inside. I will never be able to eat a supermarket scotch egg again. My main course was pork belly, which was really tender and came topped with crackling, dauphinoise potatoes and some sweet baby carrots, all served with cider jus. 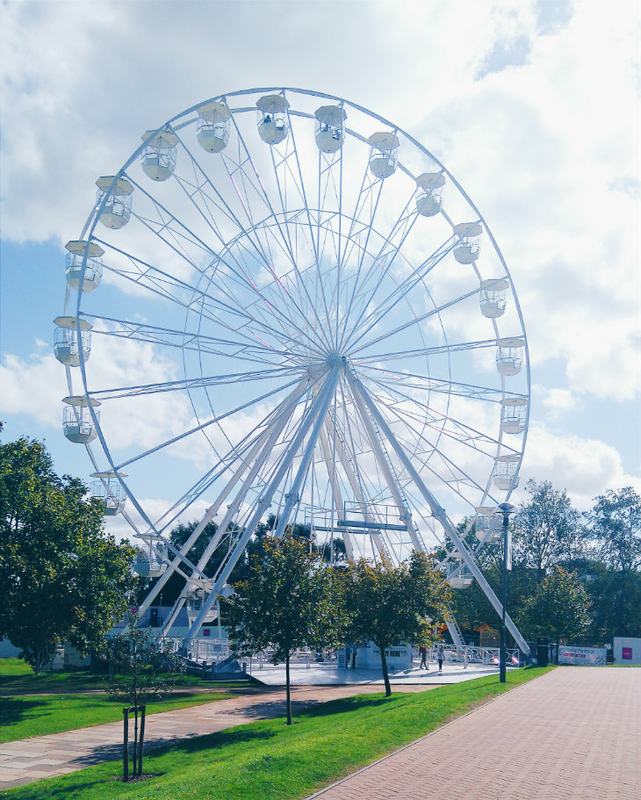 The University of Kent turns fifty this year, so they’ve stuck a big ferris wheel on campus and anyone can come along and take a ride. My cousin Georgia was down for a visit (she’s Australian but currently working in England) and we thought it would be a fun thing to do. Luckily the weather was ideal, and the views from the top were lovely. Giulia and I went to watch Back to the Future at an outdoor cinema in the grounds of Cardiff Castle, and it was so much fun. We got wood-fired pizza, then sat down on our blanket to watch the film. I hadn’t seen it before, which is unusual because Back to the Future is such a classic. Thankfully the Welsh weather held out and we didn’t have any rain! I have a clean house (that’s not falling down like the last one), great friends, and I can’t wait to get stuck into my writing projects. Sam dished the dirt on how she got bikini ready. Gemima answered the Bunny Friendly Beauty Tag — it’s always interesting to read other bloggers’ cruelty-free stories. Josie wrote a wonderful post about organ donation. Thought-provoking and well worth a read. How has September been for you? What’s made you happy this month? Let me know in the comments.